One of the hardest things that a parent with a baby has to do is try to keep them clean. Babies, with their developing immune systems are more susceptible to common germs and can become very sick from exposure to aggressive bacteria and viruses. However, these curiosity filled little bundles of energy are always exploring their environments, touching and playing with things that may be teeming with germs. And because there seems to be some unwritten law known only to babies, they put everything – no matter how strange or disgusting – right into their mouths. Yuck! What’s a mother to do? What can any parent do to limit their baby’s exposure to germs without restricting their need to explore? Try as you might, you cannot make your baby stay in one “safe” area–the laws of nature compel them to explore as part of their growth and development. What you can do is use a few simple tips to make any area they explore a lot less toxic. One of the great things about baby toys is that they are often very simple and small. Babies love things like building blocks, cups to stack, and balls. Many of these items are made from durable plastic that can withstand a thorough wash in the dishwasher. After your baby has played with these items, place them in the dishwasher for a quick rinse and dry. You will be amazed at how clean they get and how much safer they now are for your little cherub. Most bacteria cannot survive in the cold. If your child has a small favorite toy that cannot be placed in the dishwasher or clothes washer, place it in a freezer bag and leave it in the freezer overnight. The cold will destroy most bacteria and viruses that are on its surface. Use soap and water to wipe down play areas such as an infant play mat, and always use it to wash your baby’s hands. You can use a very mild soap. It does not have to be antibacterial. 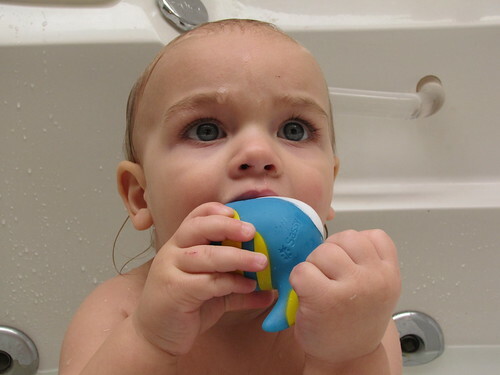 In fact, it is probably wiser for you to use a gentle soap on your baby to protect their skin. And please note that continual use of antibacterial soaps can harm a person, because then they can never build immunity to bacteria. Only occasional use of antibacterial soaps is safe for your baby. Some germ fighting sprays can be used in play areas after the baby is moved to another room. Using a household disinfectant product will clean the area and prevent germ growth. Do not spray it beforehand, however, because this product can be absorbed through the skin. While it is not harmful to adults, these germ-fighting sprays may be too strong for a baby. Unfortunately, it is impossible to eliminate every germ or virus from your baby’s life. Germs are everywhere, and many of them are actually good for people and the environment. However, you can significantly reduce the impact of bad germs and viruses in your baby’s life by following these simple steps that parents have found to be effective for many years. LaGeris Underwood Bell is a freelance writer with a deep-seated aversion to germs. As a devoted godmommy, eliminating bacteria is one of her biggest goals. A product such as an infant play mat, which is so easy to clean, is a low maintenance lifesaver as well as a time-saver for busy parents who want to keep their babies healthy and safe.